And may his peace and blessings be upon his final Messenger. My intention is to analyze the authenticity of different wordings of this tradition. This wording is established from the hadith of Yazeed bin Hayyan from Zaid bin Arqam related by Muslim (6304), Ahmad (19265), Nasai in “al-Kubra” (8119), Ibn Khuzaimah (2357) and others. This wording is also established in the narration of Atiyyah from Abu Sa’eed al-Khudri. Ya’qoob al-Fasawi relates in “al-Ma’rifah wa at-Tareekh” (1/537) through Fudhail bin Marzooq from Atiyyah al-‘Awfi from Abu Sa’eed with the wording similar to that of Sahih Muslim. At the end Fudhail asked Atiyyah, “Who were the Itrah of Prophet (S.A.W. )?” He replied, “His Ahlul Bayt”. Likewise, this has come under the hadith of Zaid bin Hasan al-Anmati from Ma’roof bin Kharraboodh from Abu Tufayl from Hudhaifa bin Usaid. It was reported by Tabarani in “Al-Kabeer” (3/67 & 3/180) and Abu Nu’aim in “al-Hilyah” (1/355), and its Isnad is weak due to Zaid al-Anmaati, as we’ll see later. Zaid bin al-Hasan al-Anmaati was weak as stated by Hafiz Ibn Hajar in Taqreeb (1/337). Abu Hatim said that he was Munkar al-Hadeeth. The hadeeth of Thaqalain was said by the Prophet (SAW) at the place of Khumm. However, according to this tradition the Prophet said it during his pilgrimage, at ‘Arafah. Zaid al-Anmaati relates it from Ja’far as-Sadiq, while the other trustworthy narrators related it through same Ja’far as-Sadiq and they did not mentioned Ahlul Bayt. Rather,during the farewell pilgrimage the Prophet (SAW) only urged people to stick with Qur’an. This tradition could be read in Sahih Muslim and other book. If it is said that Shaykh al-Albani authenticated this, then answer would be: No, Shaykh al-Albani did not authenticate this particular incident; rather he specifically authenticated the wording which was common in both this narration and other narrations. He notified the weakness in Zaid al-Anmaati there. See, As-Saheehah (1761). The other relation is that which was related by Tabrani [al-Kabeer (3/65)] through Abdul Malik bin Abi Suleiman and Harun bin Sa’d from ‘Atiyyah from Abu Sa’eed al-Khudri. This relation is not established due to Atiyyah. And the tradition through Atiyyah has come with the other wording also which doesn’t support this wording. Hence, this has been related through Katheer an-Nawa, A’amash, Fudhail bin Marzooq, Zakariyya and others from Atiyyah with the wording different than the wording related by Abdul Malik bin Abi Suleiman. Hence, Ya’qoob al-Fasawi relates in “al-Ma’rifah wa at-Tareekh” (1/537) through Fudhail bin Marzooq from Atiyyah al-‘Awfi from Abu Sa’eed with the wording similar to that of Sahih Muslim [This has preceded already]. Another tradition through Katheer bin Zaid from Muhammad bin Umar bin Ali from his father from Ali (ra). It has been recorded by Ishaq bin Rahuyah in his Musnad, as in “Al-Mutalib Al-‘Aaliyah” (16/142) by Ibn Hajar, likewise by Tahawi in Mushkil al-Aathar (5/13), through Abu ‘Aamir Al-‘Uqdi from Kathir bin Zaid from Muhammad bin ‘Umar bin Ali bin Abi Talib, from his father, from Ali bin Abi Talib….alhadith, which has the wording, “I have left behind among that which if you stick to you shall never go astray….”. Ibn Jareer records this tradition, as mentioned treatise of al-Dhahabi and al-Bidayah of Ibn Katheer, and Ibn Abi Aasim in As-Sunnah [Zilal Al-Jannah (no.1558)] without relating the part mentioning the tradition of Thaqalain, while ad-Dawlabi related it in “Adh-Dhurriya at-Tahirah” (237) in disconnected form through Muhammad bin Umar bin Ali from Ali. It was also related by al-Bazzar in his Musnad (864) through Su’ad bin Suleiman from Abu Ishaq from Harith fro Ali. This is weak due to Su’ad bin Suleiman and Harith al-A’awar. Also, there is disconnection between Abu Ishaq and Harith. Shu’bah said that Abu Ishaq did not hear from Harith except for four narrations. Yahya bin Sa’eed used to narrate from Abu Ishaq only those traditions of Harith which he actually heard from him. [Tahdheeb (2/126), Jami’ at-Tahseel (pg.245)] In our case, neither Abu Ishaq mentioned his hearing nor does Yahya al-Qattan narrate this from him. This wording also exists in some version of the hadith of Shareek from Rukain from Qaasim bin Hassaan from Zaid bin Thaabit. [Musnad ‘Abd bin Humaid] This is not present in other version of the hadith of Shareek, narrated in Musnad Ahmad and other books of hadeeth. Shareek was weak. It is known that all these traditions are describing the same statement, and the occasion was one. The Prophet couldn’t have said all of those wordings because that would be useless. The difference in the wording is due to reason that many people narrated it through meaning. So they narrated the summarized wording instead of exact wording. Prophet [SAW] could have uttered only one of those different wordings. That is the reason there is not a hadith with this wording except there is also other version of same narration exist which aids the version of Sahih Muslim. The exact wording has been narrated by Muslim in his Saheeh and Ahmad in his Musnad through Zaid bin Arqam, and this is the most authentic Isnad of Hadith Thaqalain. Similarly, the tradition of Atiyyah al-‘Awfi supports this, which was narrated by Fudhail, Atiyyah’s closest student. Besides that, the version of Muslim is also explicit. It has been narrated in a way which makes us to believe that it has been narrated precisely. This wording of Sahih Muslim is also supported by the narration of farewell ceremony related by Muslim and other through Ja’far as-Sadiq from al-Baqir from Jabir (ra). If it was necessity for the Ummah to follow Ahlul Bayt then Prophet (SAW) would have made this clear during his farewell speech at Makkah. But rather he commanded to stick with the Qur’an and later on at Khumm he repeated the same thing except that he added the prescription for the Ummah to be careful with Ahlul Bayt.
. Addition of “they shall never separate until they meet me at the fountain”. This addition is proven in the hadeeth of Zaid bin Arqam. Hence, it was related by al-Fasawi in “al-Ma’rifah” (1/536), at-Tabarani in “al-Kabeer” (5/169)(5/170) and al-Hakim in “al-Mustadrak” (4711) all of them through Hasan bin Ubaidullah from Abu adh-Dhuha Muslim bin Sabeeh from Zaid bin Arqam. Imam Tirmidhi relates it in his Sunan (3788) through A’mash from Habeeb bin Abi Thabit from Zaid bin Arqam. Its narrators are all reliable but there is some doubt whether Habeeb heard from Zaid or not. Ali bin Madeeni said, “He found Ibn Abbas, and heard from A’isha. He did not hear anyone besides them.” [Jami’ at-Tahseel (pg.158)] Therefore, this is disconnected. However, Nasai narrates it in al-Kubra (8092, 8410) and likewise Hakim (4576) and there they mention Abu Tufayl between Habeeb and Zaid bin Arqam. The statement of Ali bin Madeeni apply here as well, since Abu Tufayl was a Sahabi, but it is least applicable in case of Abu Tufayl because he was among those Sahabah who died after 100AH. Abu Tufail died in 110Ah while Habeeb bin Abi Thaabit died in 119AH. Both of them lived in Kufah. Imam Dhahabi declared this Isnad to be Qawi (strong), in his treatise on the hadith “man kuntu maulahu” (1/66, no.65). This was reported in the narration of Atiyyah al-‘Awfi from Abu Sa’eed. Imam Ahmad records it in Musnad (11104, 11131, 11211 and 11561) through Atiyyah from Abu Sa’eed. Atiyyah bin Sa’d al-‘Awfi was weak in hadeeth. This was also recorded by Imam Ahmad in his Musnad (21578, 21654) through Shuraik from ar-Rukain from Qasim bin Hassan from Zaid bin Thaabit. Shareek was weak. Qasim bin Hassaan al-‘Aamiri was Majhool al-Haal. It was also related by At-Tabarani in “al-Kabeer” (3/67) through Zaid bin al-Hasan al-Anmati, he said narrated to us Ma’roof bin Kharboodh from Abu Tufayl from Hudhaifa bin Usaid al-Ghifari. Zaid bin Hasan al-Anmati was weak as already preceded.
. Wording of “Khaleefatayn” instead of “Thaqalain”. This word comes in the tradition of Shareek from Rukain from Qasim bin Hassaan from Zaid bin Thaabit. It was related by Ibn Abi Shaibah in “al-Musannaf” (31679), Imam Ahmad in his Musnad (21578, 21654) and others. This addition comes under the hadith of A’mash from Habeeb bin Abi Thabit [from Abu Tufail] from Zaid bin Arqam. This Isnad has been discussed under the addition of “they shall never separate…” so look there. All praises due to Allah, and may His mercy and blessings be upon the Last and Final Messenger Muhammad, his family and companions. This was related by Ibn Sa’d in his Tabaqat (1/170-171) and Abul Qasim at-Tabarani in “Al-Awsat” (8/21) through ‘Anbasah bin Abdur-Rahman from Muhammad bin Zadhaan from Umm Sa’d from ‘Aisha (ra)…alhadith. 1. ‘Anbasa bin Abdur-Rahman was Matrook (abandoned). Ibn Hajar summarized the ruling on him: He was Matrook, and Abu Hatim accused him of fabricating hadith. 2. Muhammad bin Zadhaan was also Matrook as declared by Ibn Hajar al-‘Asqalani. Imam al-Bukhari said: His hadith should not be written. At-Tirmidhi said: He was Munkar al-Hadith. It was also reported by Al-Bayhaqi in “Dala’il an-Nubuwwah” (6/70, Al-‘Ilmiyya ed.) through Husain bin ‘Ulwan, he said: narrated to us Hisham bin ‘Urwah from his father from ‘Aisha…alhadith with similar meaning. Al-Bayhaqi declared this to be fabricated and said that it was fabricated by Husain bin ‘Ulwan. Ibn Hibban also declared it to be fabricated in “Al-Majruheen” (1/245-246). Al-Dhahabi agreed with him in “al-Meezan” (1/543). It was also related by Al-Hakim (no.6950) through Minhal bin ‘Ubaidullah from whom he heard from Layla freed slave of ‘Aisha. The link between Minhal and Layla is not established. It was probably Abu Abdullah al-Madani as in other reports. This later Isnad was also cited by As-Suyuti in “Khasais al-Kubra” (1/121) quoting it from some of Abu Nu’aim’s book. 1. Abu Abdullah al-Madani who was not known. 2. Secondly, Layla is not known. She is only mentioned in the report of Abu Abdullah al-Madani who was Majhool as mentioned before, hence her true identity depends only on the authenticity of this report. Besides this report says that it was Layla with whom this incident happen while the previous reports says that it was Aisha (ra). There is a third defect which are different for both the routes. In the former exist Minhal bin Ubaidullah and I couldn’t find his biography. 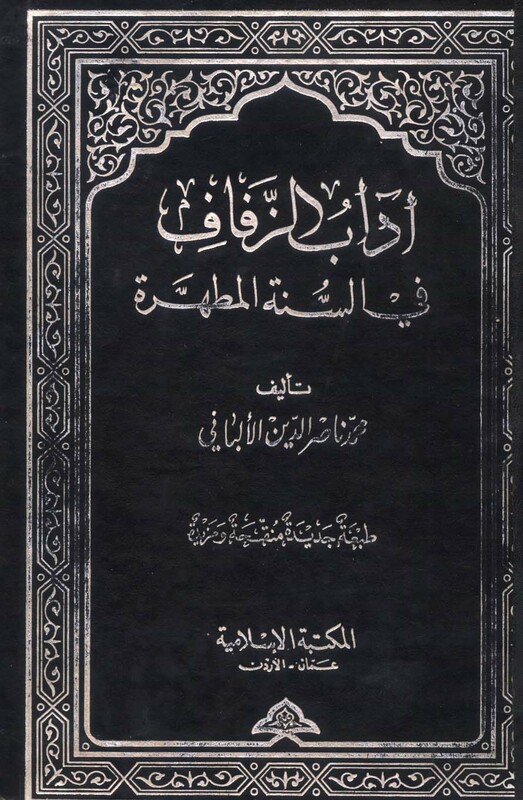 Sh Muqbil bin Haadi also didn’t mention any information on him in his book “Rijal al-Hakim fil Mustadrak” which is a book to discuss all the narrators present in Al-Mustadrak. WAllahu A’alam. In the later one, Abdul Kareem Al-Khazaaz was unreliable. There is another route for this hadith. It was recorded by Ad-Daarqutni in “Al-Afrad”, as quoted by As-Suyuti in “Al-Khasais” (1/121), and through him Ibn al-Jawzi in “Al-‘Ilal al-Mutanahiyah” (1/182) through Muhammad bin Hassan al-Umavi who narrates it from ‘Abdah bin Suleiman from Hisham bin ‘Urwah from his father from ‘Aisha (RA)….alhadith. Muhammad bin Hassan al-Umavi is alone in narrating from Hisham bin ‘Urwah, hence Ad-Daarqutni included this report among Ghara’ib or lone reports. With regards to Muhammad bin Hassan al-Umavi there is no praise mention in the books of hadith and its related sciences. Dhahabi under his entry says nothing related to criticism or praise, and later Ibn Hajar did the same in his Lisan al-Meezan. However, As-Suyuti quoted Ibn Dihyah who said, “This Isnad is established. Muhammad bin Hassan Baghdadi was trustworthy (thiqah) and righteous (Saleh)”. It seems Ibn Dihya thought him to be Abu Ja’far al-Baghdadi who was Muhammad bin Hassan bin Firoz Ash-Shaibani Al-Azraq that is why he called him Baghdadi. However, this is not established as both are different. As-Suyuti said in “Al-Khasais” (1/121): And it has a sixth route (of narration) which is Mursal. This was related by Hakeem Tirmidhi through Abdur-Rahman bin Qais Az-Za’farani from Abdul Malik bin Abdullah bin Waleed from Dhakwan that he said, “The Messenger of Allah did not have any shadow in Sun (i.e. Day) or in Moon (i.e. Night). Neither did he have any remnant of faeces”. Firstly this narration is Mursal and hence not connected with the Prophet (SAW). Secondly, Abdur-Rahman bin Qais Az-Za’farani was matrook, and Abu Zur’ah and other considered him liar. Hasan bin Harb is unidentified. I could not find any information regarding him. Related by at-Tabarani in “al-Kabeer” (25/89) and al-Hakim (6912) through the route of Abu Maalik an-Nakha’i from Aswad bin Qais from Nabeeh al-‘Inzi from Umm Ayman…. same as previous. Related by Tabarani in “al-Kabeer” (24/189) and al-Bayhaqi in As-Sunan al-Kubra (7/67) through Hukaimah bint Umaimah from her mother…similar to the tradition of Umm Ayman. Another thing which was pointed out by Dhahabi is that it was narrated by Ibn Juraij from Hukaima through “an”, so it is doubtful whether he heard it from her or not. Ibn Juraij was known for narrating madallas traditions [in more appropriate terminology “Mursal Khafiyy”]. Following are some books in refutation of Mahmud Sa’eed Mamduh Ash-Shafa’i Al-Misri. To know about him read this. Although the book is regarding the different topic but the Shaykh has refuted some of Mahmud Sa’eed’s point in the Muqaddimah (pg.49-71). He mainly pointed out the ignorance of Mahmud Sa’eed in his book Tanbeeh Al-Muslim with regards to the opinions of Ulama and verdicts of his own Shuyukh. While he critize the Shaykh for weakening some reports in Sahih Muslim and accuses him of contradicting the Ijma’, but actually his elders like Ahmed Al-Ghumari, Abdullah Al-Ghumari and Al-Kawthari, whom he highly respects, were foremost in criticizing some famous reports of Sahihayn. Then he discusses some reports on the issue. 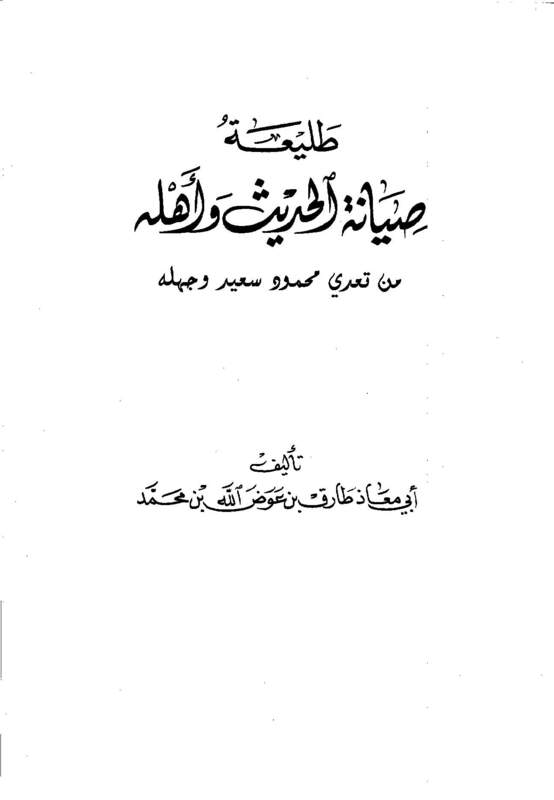 This book was written in response of “Tanbeeh Al-Muslim” by Mahmud Sa’eed which was written to show that Al-Albani broke Ijma’ by criticizing the hadith of Sahih Muslim. 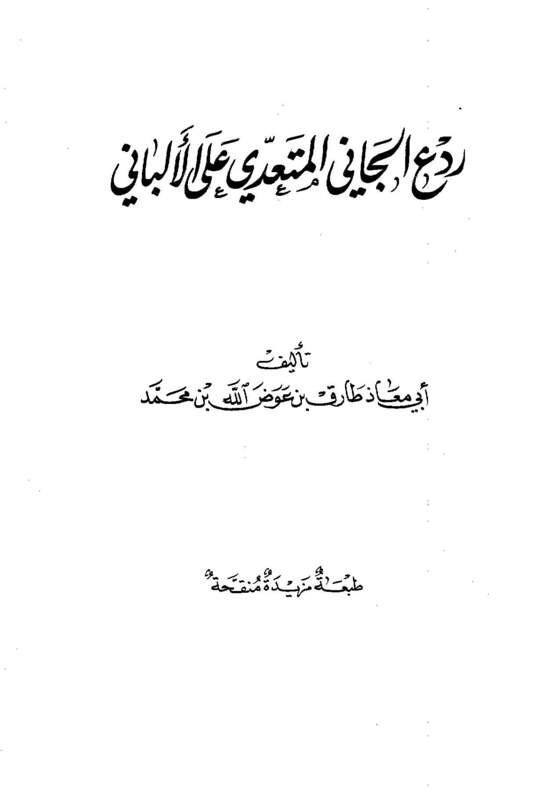 Mahmud Sa’eed, in his book, listed several hadith which according to him were declared weak by Shaykh Al-Albani. 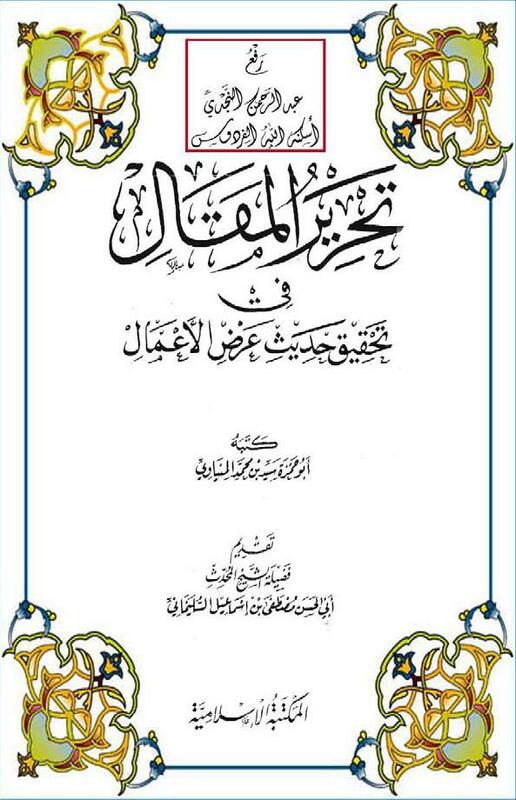 Shaykh Tariq in this book showed that in most cases Shaykh Al-Albani would only declare the isnad to be weak while he would declare the hadith to be Sahih. Many a time he would state this in the same place which was quoted by Shaykh Al-Albani, but Mahmud Sa’eed would ignore it and quotes only the part which suites his agenda. Among fifty narrations mentioned by Mamduh, only ten are those which were declared to be weak by Shaykh. Shaykh Tariq then goes on to discuss all the ten hadith one by one. The book is very beneficial as this is not just a refutation, but it also has lots of beneficial discussion on hadith based topic especially regarding the authenticity of Sahihayn. This was written in refutation of Rafa’ al-Minarah of Mahmud Sa’eed. Click here to read the index of the book. 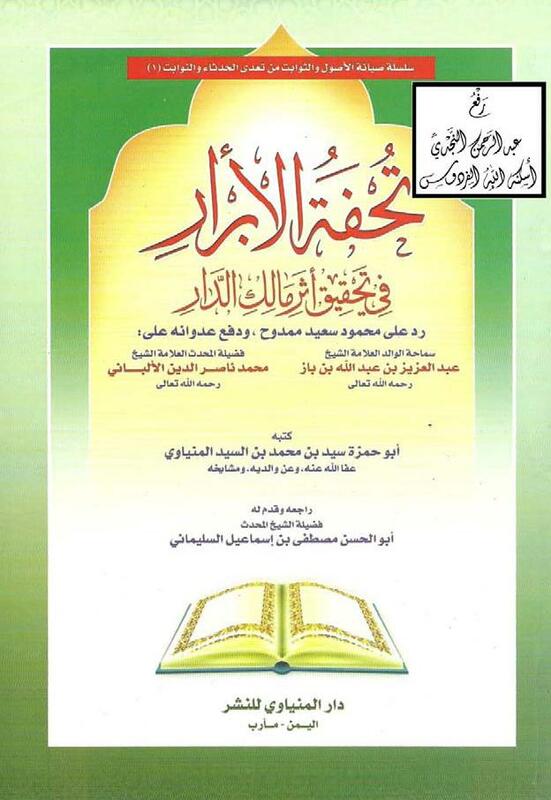 First edition, year 2007CE, Al-Maktaba Al-Islamiyyah, Cairo. This book particularly discuss the hadith of blind man and answers the claims raised in Rafa’ Al-Minarah. (2) This was reported lonely by those narrators who were not expected to bore the knowledge of such incident. (7) Contradiction with the action of Umar. Besides that he refuted several other argument of the author of Rafa’ al-Minarah. 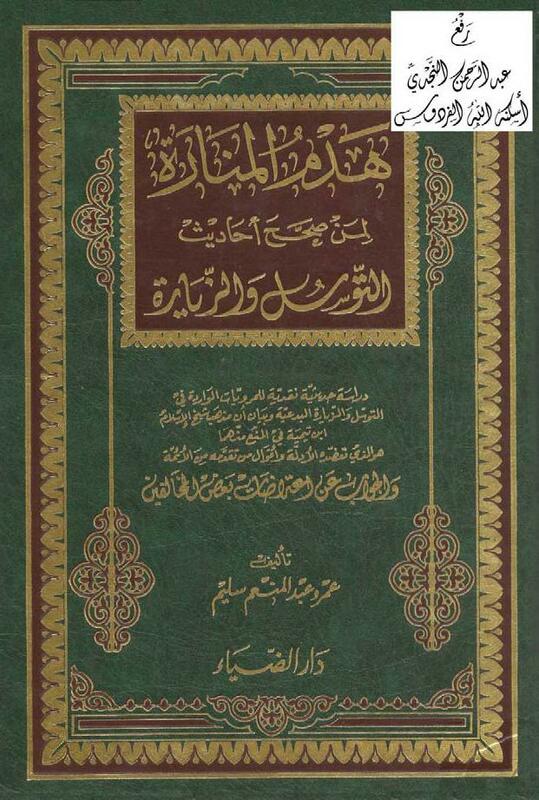 This is another book from series of refutations of Mamduh’s Rafa’ al-Minarah by al-Minyawi. This book discusses the hadith ”my life is good for you and my death is good for you”. A brief refutation of At-Ta’reef of Mahmud Sa’eed. 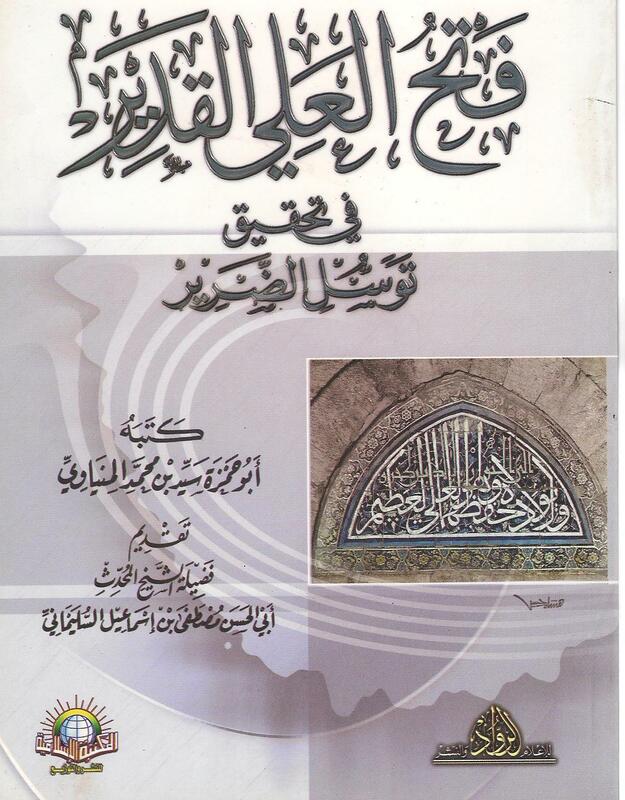 First edition, year 2009CE, Maktaba Al-Imam Al-Albani, Sana, Yemen. Refutation of At-Ta’reef of Mahmud Sa’eed in detail. 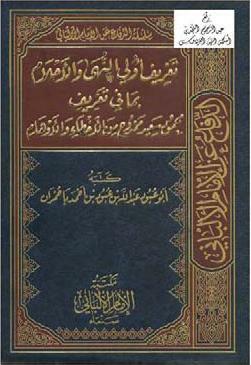 First edition, 2007CE, Daar Adhwa As-Salaf, Riyadh. Another refutation of Mamduh’s At-Ta’reef. Insha Allah, as soon as I find any new book available online I will update it into the list.